High School Graduation is a major milestone in any student's life. 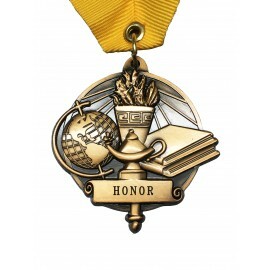 As such, it is only fitting that high school graduates are awarded with High School Graduation Medals to serve as an outstanding symbol of their perseverance, dedication, hard work and eventual success. Constructed from a shiny bronze-like material with personalized engraving to clearly identify the Graduate, Salutatorian and Valedictorian, these high school graduation medals serve as lasting reminders of graduates' struggles and successes. Make sure to reward your special graduates with the very best graduation medals at amazingly low prices by choosing Gradshop's High School Graduation Medals.